The addition of a sharp, intelligent Gemini mind to the Chinese influenced Ox's versatility is a brilliant astrological combination. Those people born of the Western Gemini sun sign and also in the Chinese Year of the Ox are said to be graced with great ingenuity. The influences of these two astrology traits combined produce individuals with highly creative thought processes. The Gemini Ox character is often known for their ability to come up with the greatest of ideas. The inventive nature and natural sociability of the typical Gemini Ox personality make them very entertaining and charming people. A Gemini Ox individual is quite good at quickly adapting to new people and new situations. 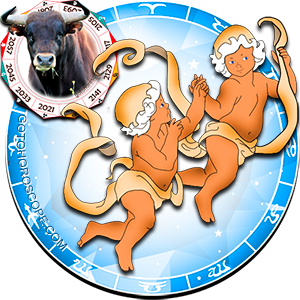 The presence of the Ox in their birth charts increases their already versatile and sociable personalities. They have a strong will and like things their own way, but are always open to new concepts and have a general understanding persona. Even though the Gemini Ox's mind is forever buzzing with different ways to do things, he will always find time for a chat. These people really comprehend and appreciate the importance of good communication to emotional well-being. These people have lots of patience for the feelings of others, and hate gossip of any sort with a passion. Aside from their incredible ingenious and adaptable minds, the Gemini Rat person possesses a calm, sensitive side. Their clever and respectful way with words proves very useful in relationships with other people. They are easily able to effectively communicate their thoughts and explain themselves, as well as listen attentively to better understand others. The Gemini Ox usually prefers a few close friends rather than lots of casual acquaintances. They are more at ease in one-on-one situations than among a crowd of people, preferring companions who share the same preference. When they form friendships, these people seem to decide more or less straightaway if they would like it to be a long-term acquaintance. A Gemini Ox personality can become a little possessive in personal relationships if they feel threatened by others� interference. They are highly selective with their choice of soulmate, and regard unfaithfulness as unforgivable. Due to their sometimes over-active imaginations, they may display occasional bursts of insecurity, resulting in a jealous streak. In their working lives, the Gemini Ox gets an opportunity to utilize their flexibility and natural genius. Their wide range of capable skills is suitable for work in almost all professions. If a Gemini Ox character is placed in a position where he or she feels unappreciated, or feel they are being lied to, their weakness of character materializes. They are prone to become stubborn and sulky, and their normal get-up-and-go diminishes. If the Gemini Ox seems a little grumpy he will usually have things on his mind; encouraging him to talk about it is probably the best way to lift their mood. They never tend to sulk for too long if they find the reassurance they are looking for when behaving in this manner. I agree with the part about gossip. I hate it with a passion and don't trust people who engage in it. I firmly believe in minding your own business. As far as being sulky, that's not really me. If someone lies to me I'll find a way to beat them at their own game. I usually have the last laugh. We're all destined to self destruct, cheat on everyone we love and look for disasters. Being a genius means creating a jacked up scenario for deeper insight. It's all true but we all know we get by with ingenuity and tenacity. We always survive but I just want stillness from my nature. I'm done telling stories and being the charming dude everyone love. Just hope I can stop my nature and start building what I have the ability to create. If i have to be lame that's cool just want to chill and stop being a Gemini ox! We're naturally conflicted people. Not loyal, don't be self deceptive... but we're awesome! Every word perfect except about the gossip. I LOVE HEARING AND SHARING GOSSIP! I even very much love hearing gossip about me. The worse the gossip about me true or not the more I'm entertained! Love it! As a Gem Ox, you are never truly stuck in anything, you may be too lazy or comfortable to get out, but ultimately you will choose to leave because you know you can be more. Or if you are forced to leave then it's time to look for that next big thing. Your get up and go is never gone, it just needs inspiration to explode. Now go get that inspiration, us Gem Oxens are too stubborn to stop fighting for what we want. This very much describes me, almost all of it actually which I was surprised by. I'm stuck in a dead-end job that I hate. I'm feeling stifled, bored and under-appreciated which has led to me being stubborn & sulky, and yes my get up and go has got up and gone! And the gossip that seems to permeate through any workplace really grinds on my nerves. My imagination is making me possessive and jealous over those close friends I do have. Jealousy is an entirely new concept to me - its not something I ever remember feeling or acting upon before. Usually I'm a pretty open, caring and lively individual - its incredible how something as trivial as a mediocre job has completely changed my life and character so quickly. DONT GET STUCK IN A DEAD END JOB! We have special talent's. I am an excellent artist and love music.The best thing to do is find your talent and then find a job that suits you. I wonder whether you can ever be 'stuck' in a dead end job? Don't sell yourself short, Gem Oxens are smart enough and work hard enough to get anything career, even run your own business. Now get out of that corner you're hiding in, stop sulking and do something about it. You are too stubborn to know how to quit. for me as gemini ox, this is true. that's my weakness also. lie and betryal made me stubborn, sulky and hang over. I can't speak anything when those happened to me. Everything describes me !!! I'm Gemini Ox , and I hate unfaithfulness ! As I am faithful !!!! 100% . Gemini oxen can be unfaithful just like all other signs, it's just that we don't like it done to us. We can cheat but are partners better not. I'm not saying that about myself though. But reguardless of a persons horoscope sign age and maturity, and morals has ALOT to do with their character. If a person is young (&) or with low morals, their apt to do anything. I think when I was younger in my 20s I didn't mind a little gossip but as I gotten older I hate gossip with passion. I am a gemini ox only things I slightly disagree with is I don't mind gossip, JUST as long as it's not about me.